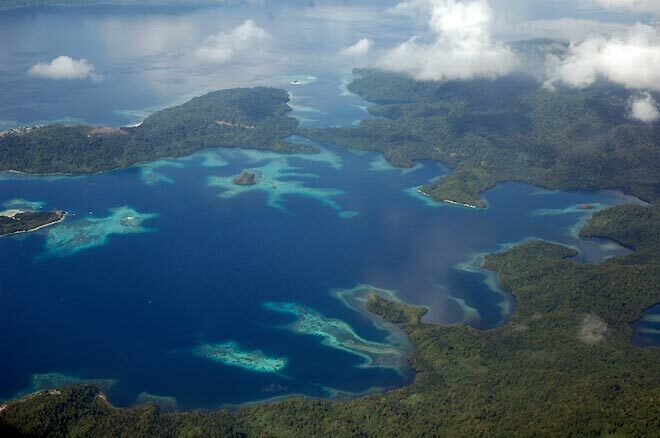 Symbiosis Custom Travel » Blog Archive » Pulau Waigeo from the sky – stunning! This should taunt anyone looking for unspoiled remote places to dive with exceptional seascapes and unspoiled islands! This pic was taken from the air flying between Sorong in West Papua to Manado on the northern tip of Sulawesi, Indonesia, as we passed over Pulau Waigeo. This is real frontier diving with some of the richest biodiversity counts recorded anywhere! Next goal would be to kayak around the shoreline to explore the untouched beaches and rainforests. Waigeo is renowned amongst birders for Birds of Paradise.